At the Farmer’s Market the other week I bought a bunch of kale. Sometimes when I buy something at the market I know exactly what I’m going to do with it. In this case, I just bought it because I like kale. A few days later I was trying to decide what to make for dinner; I didn’t want to make pasta again, but I wasn’t sure what I was in the mood for. Suddenly my mind started repeating over and over to me: kale and eggs, kale and eggs, kale and eggs… I wasn’t sure why, at first, but I was convinced they’d make a great pairing. After a few minutes I remembered that I’d had a dish at Blue Hill which involved a poached egg and some stewed kale. I wasn’t sure how they’d made it, and I assumed it was rather complicated, but I knew how I could make something similar, but much simpler and easier. I chopped an onion and the kale and began sauteing them in a pan with olive oil, salt and pepper. After a few minutes I covered it and lowered the heat, hoping to steam the kale while it cooked, thus softening it up. When the kale was just about cooked through I cracked a couple of eggs onto the top of it. The eggs began to cook immediately on the bed of kale, so I covered it again and let it cook for a little longer. 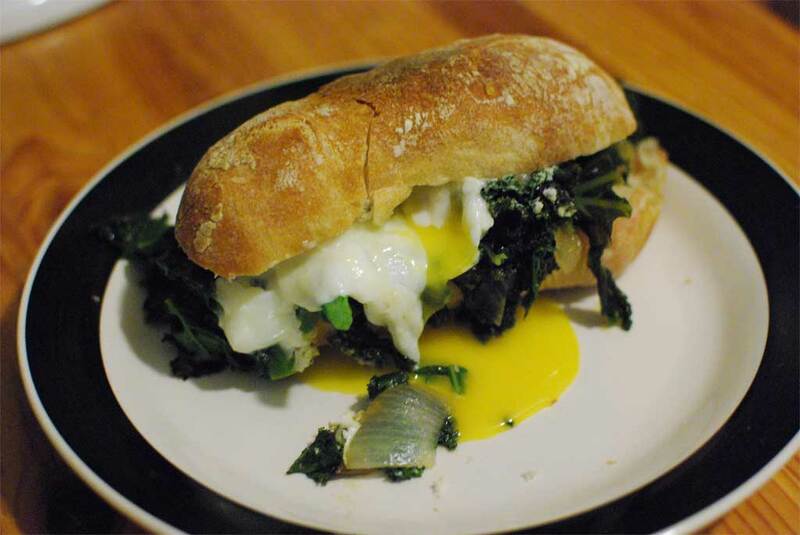 When the eggs got nicely cooked (but yolks still runny) I tasted the kale. It was good, but needed something more to elevate it. I grabbed my parmesan out of the fridge and grated some over the whole thing, like a blanket. And how to serve it? Well, I just happened to pick up a couple of ciabatta rolls on the way home from work. Why? I don’t know, I just did. It’s almost as if my brain knew they would be needed for something. This was a great meal: hearty and comforting, and yet simple and delicious. If I ever own a restaurant this is exactly the kind of dish I’d like to serve.